A couple days ago, I posted a review of a mysterious little Russian bonbon. I was really intrigued by the wrapper design and unique (although not exactly "tasty") construction and asked any readers adept in the Russian language to fill me in on what the writing on the wrapper means. And it worked! Illustrious reader, Laurafizzpop, answered my query with not only the name but the intended flavors of the candy as well as a nice contextual explanation of the candy company (see Comments section in the previous post for her response in full). So these little treats are called Candies Alyonka from the Red October chocolate company. What a name! They indeed consist of a hazlenut nougat and cookie base with a milk chocolate shell. With this all-important information I dove into the land of the internet to learn more, and as suspected, this classic brand of Russian Candy, as well as the baby painted on the wrapper, carry an esteemed past. CNNmoney.com published an article on Red October explaining that the company was established in 1867 "near the Kremlin by two German partners, the confectionary was nationalized after the October Revolution and renamed Red October in 1922. It produced chocolate, cocoa powder, toffee, tea cookies, and hard and soft candies." Although production floundered in recent years, last year Red October modernized their packaging and distribution techniques and have hit the market running to great results. I've gotta say, the packaging is absolutely beautiful, some of the loveliest I've encountered. RussianTable.com, a distributor of Russian food and beverages to the United States offers a wide variety of the company's products over the internet- looking at the packaging of the various candies feels like visiting a gallery exhibit, absolutely lovely. Also, I was able to discover the roots of the baby on the wrapper. An article on RT.com explains that the "factory even held a competition searching for a child to be the face of the famous bar. In the end the choice fell on the daughter of one of the factory’s own employees." One final question solved: I was surprised by the waxy flavorless nature of the chocolate and was wondering if this is specific to that type of candy or whether Russian chocolate leans toward a different flavor and texture profile than American chocolate. James H. Johnson, director of international marketing at the Chocolate Manufacturers Association talks about the difference in Russian chocolate in the CNNmoney.com article: "Another reason for the rise of Russian chocolate is that Russian tastes are different. 'Russian chocolate has a different taste and feel,' says Johnson. 'It's grittier because they use more cocoa. It's not as sweet.'" Well, now my curiosity is absolutely piqued. I must get my hands on more of the Red October sweets as I love the variety of packaging and the story behind the brand. 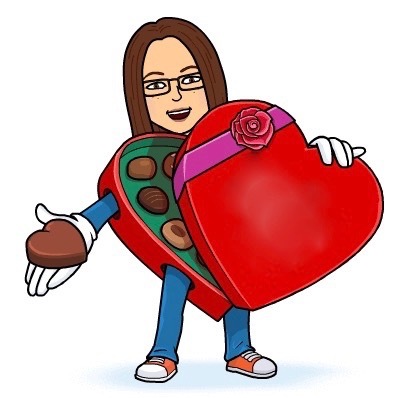 Have any other readers tasted Red October chocolate or other Russian brands of candy? I'd love to hear your thoughts. ok so you sent me over to russiantable.com and now i too am ENAMORED by the packaging on all the red october candies! the inspiration! must go to brighton beach in the near future to pick up some of these... sans scary baby... someone else can eat them and i will just look at the pretty labels! 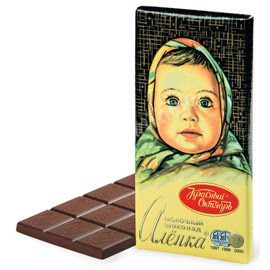 Ate the Alyenka bars regularly when I lived in Moscow. They also had a store across the river and south from the Kremlin if I recall. Great stuff.